Kielty becomes Tour Champion four times in a row. Last Monday seen the completion of the Tour Championship and a shootout between the top 8 players in the Cup to see who would become Tour Champion. It was split into 2 groups, Group 1 consisting of Hugh Kielty, Gavin Donnelly, John Casey and Niall Sweeney. Group 2 consisted of Maurice Cullen, Wayne Kilmartin, John McKenna and JJ McVeigh. After each player played everyone in their group it was down to the final 4 Hugh Kielty topped group 1 winning all 3 matches with Niall Sweeney coming second winning 2. 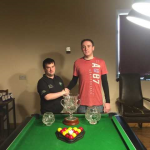 Maurice Cullen topped group 2 winning all 3 matches with John McKenna coming second winning 2. Into the semis and in a best of 13 Hugh Kielty faced John McKenna and Maurice Cullen faced Niall Sweeney. These were going to be high quality matches as Kielty McKenna and Cullen are all part of the senior Leitrim A team that have done so well the last few years at inter county level. Kielty was chasing his 4th title in a row as he has been the undisputed champion the last 3 years. McKenna got out of the traps early and raced into a 4-2 lead. Kielty fought back and reeled off a few frames to go 6-5 up. This match had all the makings of going to a decider but Kielty dished the last frame to win 7-5. The second semi between Sweeney and Cullen was also a very tight affair. Maurice went 1-0 up, then Sweeney went 3-2 up. Cullen levelled at 3-3 before Sweeney went 5-3 up. Cullen won the next to bring it to 5-4. The next 2 games were shared again 6-5. This match also looked like going to a decider but Cullen broke down on the clearance and Sweeney finished to win 7-5. So in a repeat of last years final Kielty faced Sweeney. Could Kielty be stopped as he was a convincing 9-6 winner last year. In a best of 17 Sweeney raced into a 6-3. 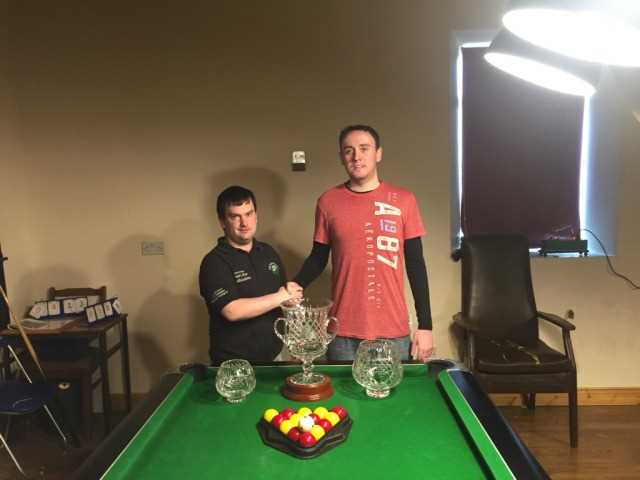 The next 4 frames were split with Sweeney leading 8-5 and only needed one more to lift the cup. Kielty, under serious pressure, remarkably took the next 3 frames to level at 8-8. So it was all down to the last frame, and showing why he is a worthy champion, broke and dished the last frame winning 9-8. Hugh congrats to Hughie to win this event 4 times in a row. This is something that as never happened before and may not again. Thanks to all the players that participated in the 5 tours throughout the year. And also to the tour committee for their hard work organising and ensuring all runs smoothly.